The Study of the water Vapour in the polar AtmosPhere (SVAAP) project, funded by the Italian Programme for Antarctic Research, is aimed at investigating the variability of atmospheric water vapour, and the long-term variations in stratospheric composition and structure, and in the surface radiation budget at the Thule observatory (76.5° N, 68.8° W), Greenland, in the framework of the international Network for Detection of Atmospheric Composition Change (NDACC). In addition to continuing the long term measurements of stratospheric parameters and surface radiative budget, the project includes the realization of an intensive field campaign to start and validate NDACC measurements of water vapour profiles in the medium and upper atmosphere through the use of new instruments. The intensive measurement campaign gave also the possibility to study the cloud physical and optical properties and how they affect the surface radiative budget. The field campaign was held from 14 to 28 July 2016. 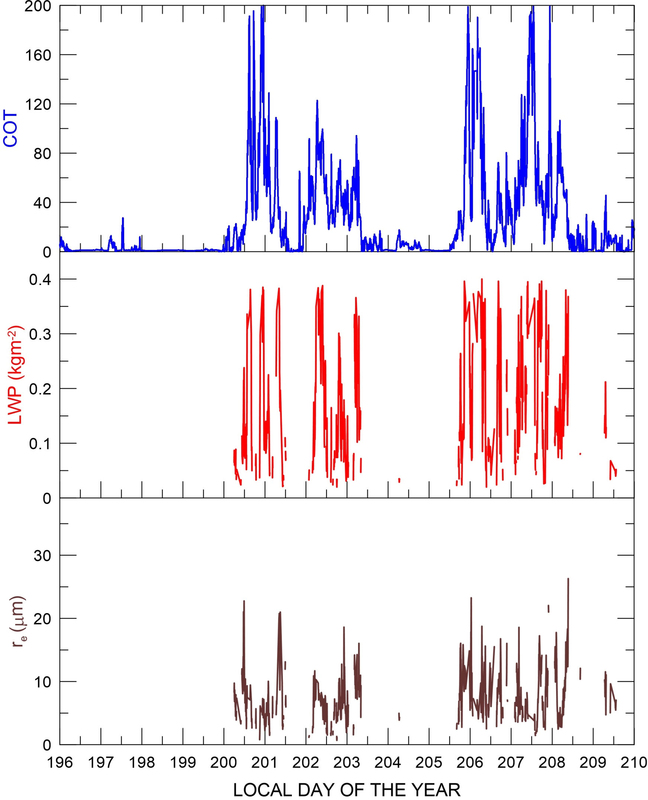 A new 22 GHz spectrometer, the water Vapor Emission Spectrometer for Polar Atmospheres at 22 GHz, VESPA-22 [Bertagnolio et al., 2012], was installed for continuous unattended measurements of water vapour profiles from 30-35 km up to 70 km and integrated water vapour. Moreover, 23 radiosonde RS92 were launched during the campaign to obtain vertical profiles of pressure, temperature, relative humidity, wind direction and speed up to about 30 km. The elastic lidar was operative during the whole campaign for the retrieving of tropospheric aerosol and clouds profiles at 1064 nm and 532 nm (at two different polarizations). 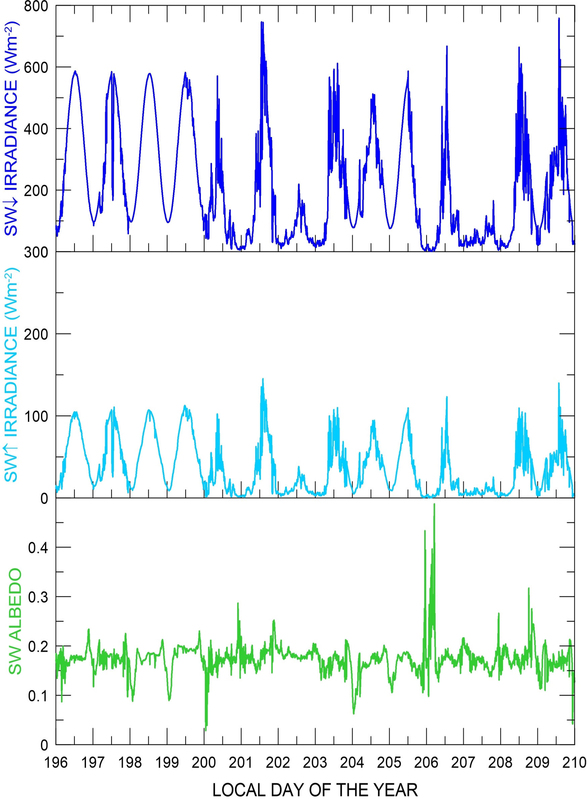 Figure 1 shows the time evolution of downward and upward SW irradiance, and the derived SW albedo. The first part of the campaign was characterized by stable cloud-free conditions, while alternation of cloudy and cloud-free sky was found after 18 July (day number 200). 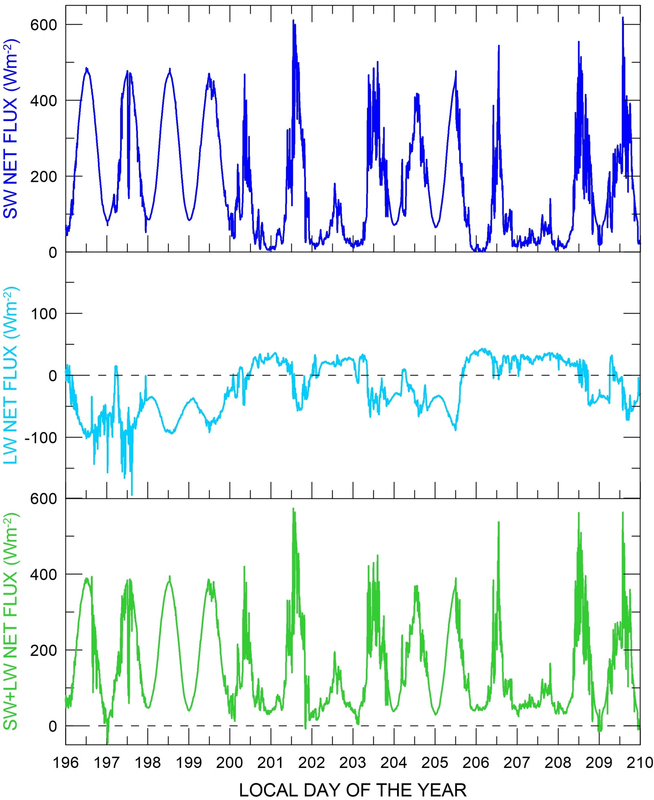 Figure 2 presents the time series of the sky infrared brightness temperature, the downward infrared window irradiance and in the broadband LW spectral range, and the upward LW irradiance. All the upward-looking instruments detect the atmospheric changes, although a larger variability is captured by the pyrometer due to its narrow field of view (about 1.5°). The small differences between the broadband and the infrared window irradiances is due to the small sensitivity of the infrared window measurements to water vapour. Figure 3 shows the cloud optical thickness (COT) derived following Barnard and Long , under the assumption of homogeneous cloud cover, the measured LWP, filtered for values lower than 0.4 kg m-2 [Löhnert and Crewell, 2003], and the derived effective droplet radius re, assuming that the cloud liquid water content increases with altitude. Figure 4 shows the surface radiative budget for the SW, the LW and the total (SW+LW). While the SW SRB is always positive during the measurement campaign, the LW SRB is negative under cloud-free conditions, becoming positive during cloud occurrence. 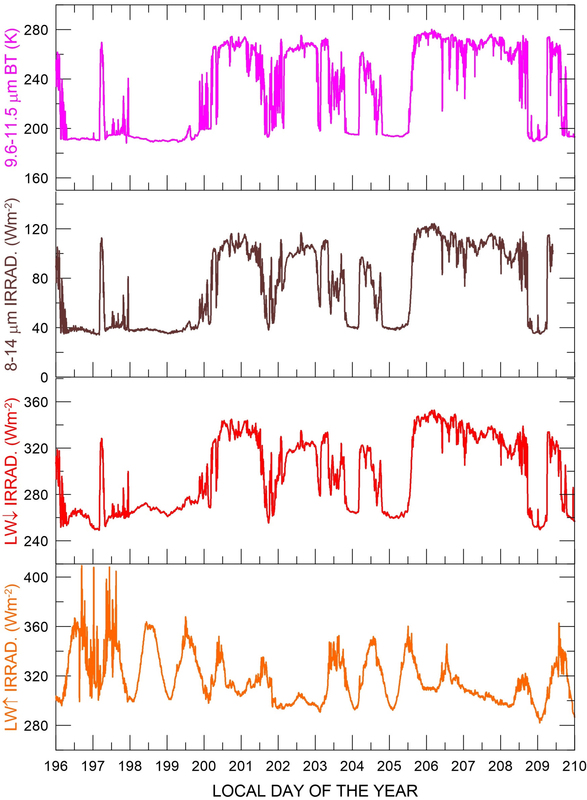 The total SRB is positive and its variability is dominated by the SW irradiance. Clouds reduce the SRB compared to cloud-free periods, thanks to the dominating SW effect.